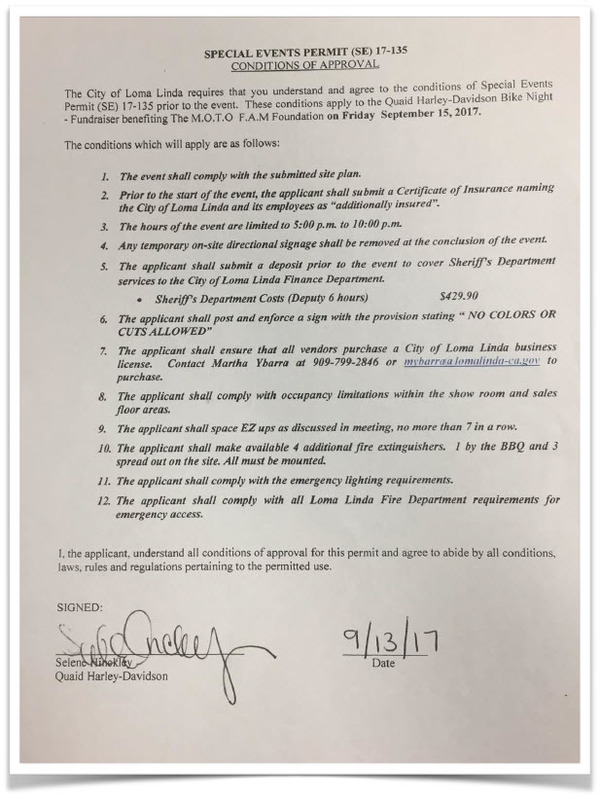 A Harley Davidson dealership located in California (Quaid HD) agreed to a “no motorcycle colors” policy as a condition of a SPECIAL EVENTS PERMIT application provided by the City of Loma Linda. The application was signed by Selene Hinckley of Quaid Harley-Davison. It is well established that motorcycle club colors are protected by the First Amendment from government discrimination. Loma Linda’s permit requirement is a blatant infringement on the protected rights of expression and association. And Harley Davidson, by being complicit, is arguably in collusion with the local PD and may therefore be liable under the state actor doctrine. Maybe more important, Harley-Davidson is discriminating against the very foundations that their brand rests upon. Can you imagine the economic impact if motorcycle clubs, their members, their friends, and their families refused to buy motorcycles or apparel from Harley-Davidson? The National Council of Clubs (NCOC), a group of motorcycle clubs dedicated to advancing the legal, legislative, and political interests of motorcyclists nationwide, has reported to the MPP that they will be sending an official complaint to the City of Loma Linda requesting that the discriminatory “no colors or cuts allowed” condition be removed from all policies, permits or procedures. Additionally, the NCOC intends to send a complaint to Harley-Davidson, Quaid and Corporate, reminding them that they are a complicit party to unconstitutional behavior and that abandoning the club community is a potential economic disaster for an iconic brand. The MPP will keep close tabs on any new developments in the story. Until then, the MPP encourages motorcyclists and their supporters to contact Quaid Harley-Davidson, Harley- Davidson Corporate, and the City of Loma Linda to voice their condemnation of blatant discrimination. The post Harley-Davidson Dealer Bans Motorcycle Colors at Bike Night appeared first on Motorcycle Profiling Project. This entry was posted in Motorcycle Profiling Project on September 21, 2017 by Webmaster.